Ryan getting some typing in before school. Can you tell his favorite team? Everything in Ryan’s room is disorganized. Months-old school worksheets mix with notes from some hockey box score in piles across the desk and bookshelves. Every so often we make him go through the exercise of “keep it/trash it” to prevent the piles from growing too large or for some key homework assignment from going missing. Those impromptu cleanup sessions have another benefit. 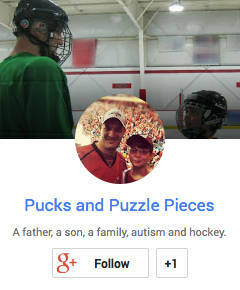 I often discover just what Ryan has been up to during the times he spends pounding away on his computer keyboard. Ryan spends a lot of his free time typing. 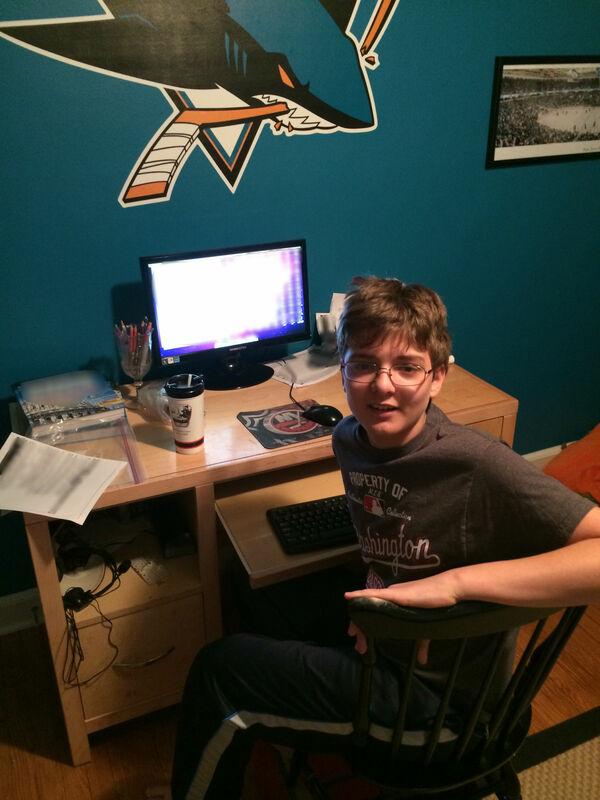 If he’s not eating, or shooting on the street hockey net on the patio, or watching hockey (either live or highlights on NHL.com), or doing homework, or at ice hockey, chances are he’s typing on the computer. He’s a furious, fast, and LOUD two-finger typist. From those fingers, and from his imagination, spring forth a remarkable amount of work. He types hockey stats and standings, in perfectly aligned columns, by the dozens. The games could be real, but are more often imagined. They are sometimes based on one of the thousands of memorized results stored in his incredible brain. The Microsoft Word documents are stored by dozens, by hundreds, maybe even by thousands, in a series of folders on his computer desktop. The files are organized — far more than anything on his real desktop — according to a system that only he understands. But if you ask him to find a particular one, there’s no doubt he knows exactly where it is. There are more files on a flash drive he uses to transport them between computers in the house and at school, where he will sometimes type if he finishes an assignment early and has free time. There are stories, too — detailed, realistic-sounding, quote-filled recaps of games that he imagined. In the bookshelf there is a stack if probably close to 50 type-written pages of them, printed out, stapled and stacked. When we go through the room-cleaning exercise, Ryan always insists they stay. Sometimes he’ll burst from his room and run the two flights to the basement, where the printer is located. He brings his latest story to us and insists we listen as he reads it. I had my reasons. He would sometimes get so upset during these typing sessions that a meltdown ensued. We discovered the key was to limit him to smaller chunks of time. There was even a time we removed the computer from his room — with his permission — because of the issues it was causing. But that feels like a long time ago. I can’t remember the last time Ryan had a meltdown over typing stats. And those game stories serve a purpose, sharpening his writing skills and utilizing his imagination. Besides, typing stats makes him happy. We have learned to recognize and respect the importance of such behaviors. There are times we still have to limit him — to encourage him to exercise, get outside, and prevent getting locked in on any one activity. But I don’t think we’d ever cut him off from this activity completely the way we once tried to. Typing hockey stats serves a lot of purposes for him. It regulates him. It is his stim. As such, it demands our recognition and respect. It is many things but it is certainly not unproductive. He’s got a stack of paper and a thousand computer files that argue otherwise. And something else — it may just carry him to a career one day. Great post (as usual!). Have a great week. I hope that he can develop his first love into a career…like his father. That “disorganises organization” is something i recognize in me (and other people as well).